New to the Airwaves – Albums Out Today (Feb 1) Reviewed by Dianna Augustine on January 31, 2019 . OH HEY concert season preparation crews. Let’s get busy! Tons of bands are in full swing announcing their Spring and Summer Tours and we are literally living for it. This week’s arrivals are sure to find homes on many a playlist, especially with Beirut ,Cherry Glazerr, Set It Off, Nina Nesbitt and more, dropping full-lengths. 2018 Rookie-of-the-Year Lil Baby has had an all-star rise. In just a year and a half he has exploded onto the scene with his six solo projects including his highest-charting mixtape Street Gossip which debuted at #2 on the Billboard Top 200 chart, and the critically-acclaimed debut album Harder Than Ever, which debuted at #3 on and featured the RIAA Certified Platinum smash hit “Yes Indeed” featuring Drake. This year he also collaborated with fellow Atlanta native Gunna on their stellar joint mixtape Drip Harder which also debuted at #3, and boasted the 3-time RIAA Certified Platinum single “Drip Too Hard” which held #1 at Urban Radio for three weeks in a row. Just last night he took the stage with Yo Gotti to perform their new song “Put a Date On It” live on The Tonight Show Starring Jimmy Fallon, his second TV performance in the past half a year. During his rapid rise in music, Lil Baby has racked up more than 3.8 BILLION streams across all platforms and recapped his compelling story on film in his ‘ Preacherman‘ documentary. He also joined Drake as a special guest on the ‘Aubrey and the Three Migos Tour‘ and made his debut TV performance on Jimmy Kimmel Live! performing “Yes Indeed.” After performing and being nominated for Best New Hip Hop Artist at last year’s BET Hip-Hop Awards, signing a deal with Reebok, and multiple chart-dominating projects and singles, there is no question that Lil Baby is one of the leaders of this generation in hip-hop. Judah & the Lion drops the official music video for their new single “Over my head” today as the song breaks into the TOP 15 at Alternative Radio its second week out and racks up more the 1 MILLION streams. The clip premiered live today via YouTube at 2pm PT/5pm ET. Over my head” follows the ascent of “Take It All Back” which spent three weeks at#1 at Alternative Radio before launching the band onto an international stage. In addition to the April run, Judah & the Lion have been announced for this year’s HangoutMusic Festival in May and Lollapalooza Paris this summer, with many more live shows set to be announced soon. For the most up-to-date information, please visit www.judahandthelion.com. Billie Eilish releases new track “bury a friend” with Debut Album Pre-order “WHEN WE ALL FALL ASLEEP, WHERE DO WE GO?” on Darkroom/Interscope Records. NORTH AMERICAN FATHER OF THE BRIDE TOUR DATES ANNOUNCED Including Madison Square Garden September 6, Hollywood Bowl October 2 & More, Father of the Bride Out Spring 2019 on Columbia Records. Self-Titled Debut Album Certified Platinum. 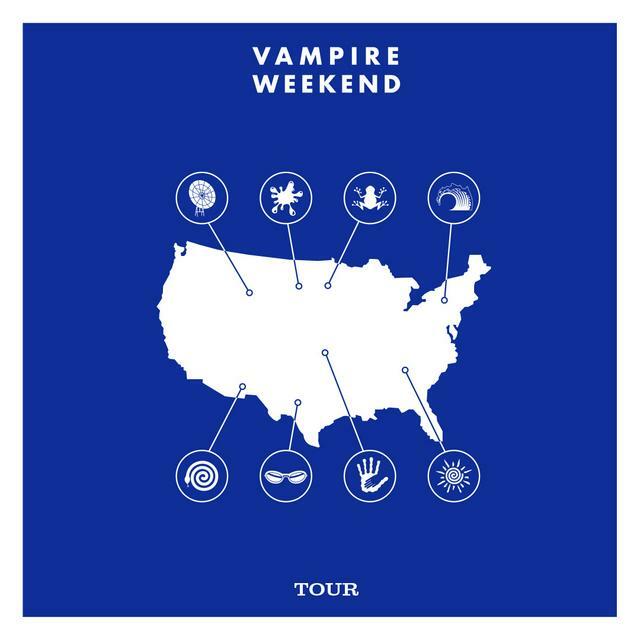 Last week Vampire Weekend released the songs “Harmony Hall” and “2021″ from their upcoming fourth album, Father of the Bride, to an ecstatic critical reaction. The first band to grace the cover of SPIN magazine before an album was even released, Ezra Koenig, Chris Baio, Chris Tomson and former member Rostam Batmanglij met in 2005 at Columbia University in New York City. “Even without an album, Vampire Weekend has made one of the year’s most impressive debuts,” said The New York Times of the band’s earliest recordings. Jim James has announced plans for a spring headline tour. 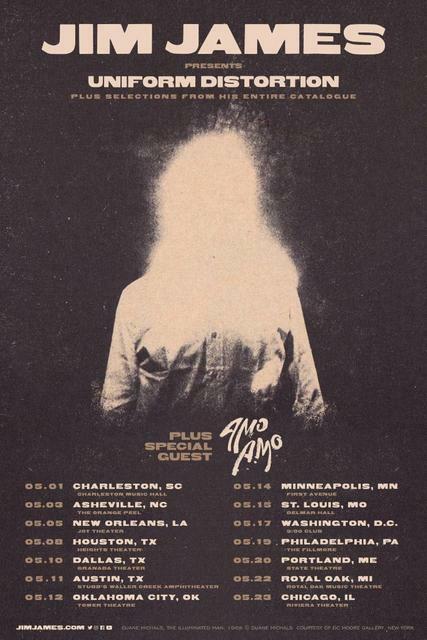 The Jim James Presents Uniform Distortion tour – which sees James backed by his longtime live band – begins May 1 at Charleston, SC’s Charleston Music Hall and then continues through the month. James – who has only just wrapped up a series of intimate European headline shows – will bring his first full band performances of last year’s Uniform Distortion along with selections from his entire catalogue to U.S. festivals at Atlanta, GA’s Shaky Knees Music Festival (May 4), Manchester, TN’s Bonnaroo Music & Arts Festival (June 15), Telluride, CO’s Telluride Bluegrass Festival (June 20-23), and Quincy CA’s High Sierra Music Festival (July 4-7). In other news, James recently announced the upcoming release of UNIFORM DISTORTION/CLARITY: DELUXE EDITION, an expanded vinyl reissue joining his acclaimed 2018 album, UNIFORM DISTORTION, with its acoustic companion volume, UNIFORM CLARITY. Limited to 1,000 individually numbered units, UNIFORM DISTORTION/CLARITY: DELUXE EDITION arrives via ATO on March 22. Paired in a die-cut gatefold jacket, pressed on specialty foil, UNIFORM DISTORTION/CLARITY: DELUXE EDITION sees both albums printed on newly colored vinyl, with UNIFORM DISTORTION available in a black and gold vinyl mix and UNIFORM CLARITY in a black and white vinyl mix. Furthermore, UNIFORM DISTORTION/CLARITY: DELUXE EDITION appends UNIFORM DISTORTION with two tracks from the original sessions, “It Will Work Out” and “Flash In The Pan” (Rock and Roll Versions) – both first released on Uniform Clarity – and also includes an exclusive 7″ single comprised of four never-before-heard cover versions: “Hot Burrito #1” (originally performed by The Flying Burrito Brothers), “How?” (John Lennon), “Fallin’ Rain” (Link Wray) and “Dark End of the Street” (written by Dan Penn and Chips Moman and recorded by innumerable legendary artists). Lastly, UNIFORM DISTORTION/CLARITY: DELUXE EDITION includes a double-sided foldout poster signed by James and exclusive to this release. James made a number of live appearances surrounding the release of UNIFORM DISTORTION, including sold out full band shows in New York and Los Angeles, as well as high profile TV performances on ABC’s Jimmy Kimmel Live!, NBC’s The Tonight Show Starring Jimmy Fallon and CBS’ The Late Show with Stephen Colbert.